My old leather bracelet lasted half a decade, but it finally broke the other day. Yesterday, I made a new one in about the time it took to drink a cup of tea. It's just a strip of leather with 2 parallel lines cut down the middle to divide it into 3 strip, leaving it connected at both ends. Some some fancy braiding goes on in the middle part, then snaps are added at the ends. The whole thing gets dipped in some neatsfoot oil, which makes it softer and gives it a darker color (you can see the original color of the leather it was cut from at the top). The old bracelet, seen in the upper left corner, is darkened from age. You could (and should) sell these! Wow. Looks fantastic. Agree with Richard - you could sell these. How on earth do you do the fancy braiding when it is connected at both ends? There are other diagrams out there, but they are all equally confusing, and it takes me a good bit of figuring it out every time. 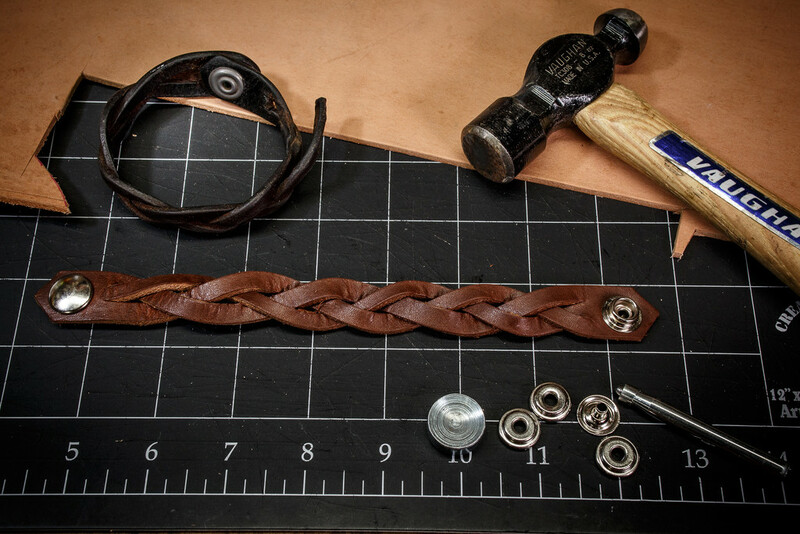 Since my bracelet is 2x the length of the woggle, I have to do that same braid procedure twice in a row. I was never a boy scout.